Pat made this, her first quilt, as a distraction while her newborn grand-daughter underwent treatment for a life threatening heart condition. 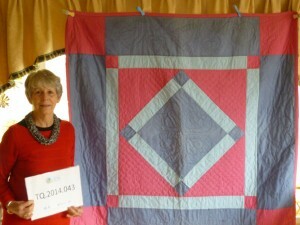 She talks about the support she had in making the quilt by hand, and how the quilt has been used. Later she discusses her family links to sewing and quilting, different techniques including Stack and Whack and how she feels when a quilt comes together. Pat has been involved with Project Linus for about 15 years, she talks about her role in making and distributing quilts to ill, disabled, disadvantaged and distressed children. Jennifer Wemborn [JW]: So if we could start off by looking at the quilt that we have here. Perhaps you could tell me a little bit about it? Pat Thompson [PT]: Yes, it’s the first quilt I ever made and it was for my grand-daughter Rose who was born fourteen years ago in the Millennium Year of 2000. She was born with a major heart defect and had open heart surgery when she was two weeks old, and it was such a dreadful time for everybody [pauses]. It was a terrible time for everybody and I was very jittery. I didn’t know what to do with myself and I saw an advertisement in the local paper for a quilting weekend in May; she was born in the March. So I didn’t know what to do, where to go to get the materials. I was told about a shop in Roding Valley called Just Between Friends so I went along with my sheet for instructions and two very nice women, Carol and Isabel, who owned the shop, helped me to choose the fabric. It’s an Amish design, tradition, very traditional, and usually it would be much darker colours. The only dark colour I’ve got is navy blue which is now very washed-out blue. And they were really, really helpful. So I went along to the class and I made this top in a weekend and the teacher, a lady called Anne Stacey, is a brilliant teacher and a brilliant quilter. She couldn’t believe I’d never done it before. I had to borrow scissors, I’d never used a rotary cutter or anything like that. I had to borrow a mat, and I managed to get the thing together and she absolutely motivated me to carry on. 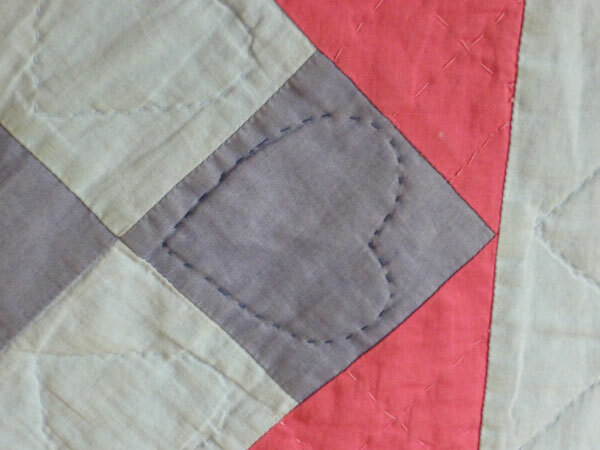 I chose hearts, obviously, because of Rose’s condition and although I say I can’t hand quilt, actually I did hand quilt it, and looking back on it, it doesn’t actually look too bad [laughter]. But it did keep me busy for those few months when we didn’t know really whether she would survive or not. But she did, and she’s 14, she’s wonderful. JW: And how long did it take you then to… you said you put the quilt top together in a weekend, which is amazing for your first quilt. How long then did it take you to do the hand quilting, cos there’s a lot of hand quilting on there, lots of hearts? PT: Yes, there is. I had started to… I had a… I made a paper, a cardboard template when I was on the weekend course, in fact various templates cos they’re different-sized hearts, and I did actually start to draw out the templates on the, on the quilt. I actually got it sandwiched together as well during that weekend and I suppose it took me about two weeks after that to finish doing the hand quilting cos it was very simple and I really wanted to get it done so that I could give it to my daughter for Rose. Since then I haven’t really done much hand quilting but I obviously can do it because it’s there! It’s very washed-out now, been used an awful lot cos my daughter has had three other children since Rose so it’s been toted about all over the place: it’s been to France, it’s had cats on it and all sorts. JW: And it lives back here with you now. PT: No, I had to ask to borrow it [laughter] I had to ask to borrow it, and it had to be found because I’ve made loads of quilts for the children since then. So this one’s been relegated really to putting in the garden, you know, when they’re playing games and stuff like that or sitting on the floor with it, so no it still lives with Rose. JW: Thank you. So that covers really how you got into quilting in the first place. But I think you said that you’d done other sewing before that, dressmaking and so forth. PT: Yes, my mother was a brilliant dressmaker and she taught my sister and myself, my older sister and myself, to sew. She made all our clothes and so we learned to make our own clothes. I used to make all my own suits for work, and when I had my children made their clothes, even made shirts for my husband. But then as time went on I didn’t need to do that and I did a lot of knitting too cos my mother and her sisters were great knitters, as most people were in those days. But I hadn’t really done much sewing I suppose cos I was at work teaching full-time, not much time to do things. But when quilting came along, it sort of fulfilled my need. I’m a very picky person and I like things to be right and precise and it really does fulfil that need of not perfection but of doing things properly – measuring properly and things like that. So yes it just does fulfil that very sort of picky side of my nature. JW: Are there any other quiltmakers in your family? PT: Yes… surprisingly my older sister who’s lived in Australia for about… over 40 years, she could also sew and about… I suppose about 10 years ago it must be, she used to come over every year to see my mother [background noise] and on this one occasion she said, ‘Oh, I’ve brought something for you’. Anyway, out comes this wonderful quilt of Australian flowers, absolutely beautiful. And I said, ‘Well that’s funny, cos I’ve got something for you too’. And I’d made a quilt, I went to a class and I’d made a quilt and I can’t remember the name of the block… I think it was called Stack um, it was a technique called Stack and Whack where you sort of fussy-cut things and then it’s all supposed to come together but it did sort of. And I made hers in a sort of, what I perceived to be aboriginal colours – oranges, dark browns, blacks and things like that. So I gave her a quilt and she gave me one, neither of us knowing that we had started quilting some time before. And it was just a revelation because now of course we’ve got lots in common although we live such a long way away. And when she’s over here we always try and time it so there’s a quilt show to go to. But not my, my other two sisters who are younger than me, be about 10 years younger than me, they’re twins, one of them doesn’t do any craft at all, one of them is a brilliant artist, great on interior design, that sort of thing, but nobody else as far as I know – certainly not my daughter who hates sewing. JW: So you’ve said a little bit already about you prefer machine quilting. Why do you prefer the machine to the hand sewing? PT: Well, because I always seem to be in a hurry with everything. Machine quilting is quick for me and I’ve got a couple of very good sewing machines and of course my mother taught me on the Singer sewing machine, on a treadle machine, so it’s a bit like a computer, you know, I tend to use a computer to write rather than a pen or pencil and the same with quilting, with sewing, you know, I go to the, rather than get the needle and thread out I go to the sewing machine, although as I said I have done a little bit of hand quilting and I would love to know and learn how to do it properly, all that rocking machine that you do with the needle. But it’s not quick enough for me cos I like to get on really, that’s why. JW: And you said that you’ve got a quilting frame which must make the operation a lot simpler. PT: Yes, I bought a quilting frame with my friend Brenda Bales, we shared the cost, about four or five years ago because I had a spare room and that’s where it lives. I wouldn’t say I’m an expert on it but when I want to just do an all-over design it’s absolutely brilliant. I made my daughter a white cover for her bed which was very, very challenging. I had to make it in three separate parts and then join them together but I did it on the quilt frame and it really is lovely, I love that vermicelli look to things. I have tried doing other sort of designs but I’m not really as proficient as other things than doing vermicelli which is very simple and quick to do. 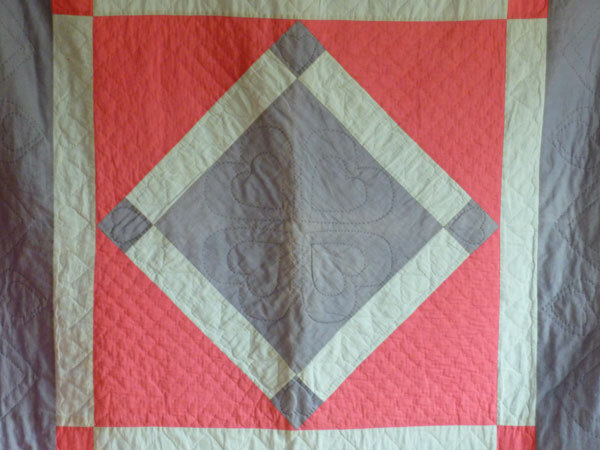 Once you learn how to put the quilt on and match it all up then away you go, it’s very quick. So another reason for having a quilt frame. JW: What do you think it is that you really enjoy about the quiltmaking? PT: I think it’s the sort of creative side of me which is not that well developed and not like my sister. But it’s the precision of it I suppose and it’s a, it’s a bit like accounts, which I used to teach: when everything comes together and it balances, it’s the same with a quilt, that whatever design you’re doing it all comes together, you’ve matched all the points and there you have a finished piece. So I suppose it’s that part of me – and it’s using the skills that I learned with my mother too, because sewing is sewing basically, you know, whatever you’re doing with it, and it’s just using those skills. And also, I have met the most wonderful people, other quilters are just brilliant, they’re just the nicest people. And often we’ve been in sort of personal situations that everybody sort of helps you out with. So that’s another very large part of quilting, the social side of it. JW: Which do you think is the best, you know there’s various stages to making a quilt. Which do you think is the best bit? PT: I think the construction probably. There’s sort of measuring and figuring out which bit goes with which and auditioning the fabrics and that sort of thing. And I love the sewing together. The sandwiching I hate because if it’s a big quilt you’ve got to find a space to do it and my knees, I cannot do it on my knees on the floor any more so I tend not to make very big quilts. But I think once you’ve done it and you’ve got your, your binding on you look at it [draws breath] I had loads of bits of fabric and now it’s still loads of bits of fabric but it’s actually got pattern to it and a design… but you can actually see… But I think the sewing together I enjoy the most. The quilting I enjoy probably the least, which is why I usually use the machine cos again of the time thing, I like to get it done and out of the way. JW: So how much time would you… How often do you quilt? PT: I sew nearly every day. If I go for more than a couple of days without sewing I get a little bit twitchy. It’s a bit like lots of vices I suppose. In the summer I tend not to sew a quilt that much because we have a big garden and an allotment and things take precedence really. In the winter I tend to sew quite a lot because two friends and myself usually have a craft stall at a local market in Epping and it’s a lot of work to make things to sell on the stall so… The winter I suppose from about October to the end of November I’m usually sewing frantically for the, for the stall. After Christmas I then look at all the things I haven’t done and try and get on with quilts for other people and suchlike, but I, I tend to like to sew almost every day, even if it’s only for a quarter of an hour. It’s for my relaxation, I suppose, it’s therapy, the same as other people do, I don’t know, gardening or whatever – I like to sew. Because it’s for me, and it just gives you your own bit of space in the day. JW: Now you mentioned the stall in Epping and that reminds me of your involvement with the Project Linus. So I wonder if you could tell us a little bit, perhaps a little about the charity first, and then how you came to be involved in it? PT: Project Linus UK started in 2000 – funnily enough the same year that my grand-daughter was born – and it came to us from America. It was started up by a lady called Karen Loucks who noticed when she was working I assume in a hospital or somewhere like that, that the very small children – usually these were children who had life-threatening illnesses, usually cancer, started off with oncology patients, they didn’t really have their own little blankets or quilts so she thought she’d make some. And… she called it Project Linus after the cartoon character who used to trail his little blanket behind him. So Project Linus was born and it came to us in 2000, and I suppose I got involved, well, it can’t have been long after Rose was born. Because our local coordinator, a lady called Val Lilley, she was moving to Surrey and she asked me to take some quilts up to Evelina’s Children’s Hospital in St Thomas’s so I did and then she said ‘Oh could you take some to Whipps Cross which is our local hospital, did that, she said ‘Do you think you could take over my area?’ so I said ok. And so I became the coordinator for south-west Essex and part of east London. Another lady called Linda Libby, she does Whipps Cross now. So basically what I do is I take quilts, blankets, knitted blankets, knitted hats, knitted cardigans, anybody, anything that anybody really wants to make, and I take them to various hospitals. A lot of the knitted blankets go to the neonatal babies, very tiny babies from 24 weeks, and the knitted ones are much more preferable than quilted ones for tiny babies cos they ‘tuck’ around them and keep them nice and cosy and warm. So I started off taking to Whipps Cross and then Linda Libby took over that, that sort of area, and then I’ve made contacts all over, now: University College Hospital, Queen’s, [inaudible], King George’s, very recently in fact in the last two weeks I’ve finally managed to make contact with the Royal London Hospital, which I’ve been trying for ages to help them. I’ve now taken 12 quilts and about 20 little blankets up to them. I also take them, well actually they’re collected from me because it’s too far for me to go, to a hospice in Billericay and it’s an adult hospice but the quilts are for the children of parents, or grandparents, other relations who are in the hospice and they use them and… for them to sort of cuddle together with their, the dear relation, and often, we always leave plain blank squares because then they can write little messages to each other. We’ve also donated to a counselling service in Woodford for families and children, and up to now our group, well, our group is not just one group of quilters; I have people in Harlow called the Sunshine Quilters, there’s a U3A group from Harlow who make quilts, there are numerous friends who knit the small blankets, people I don’t even know who knit the small blankets, there’s a couple of groups in Barking and Dagenham, the Women’s Institute in Barking and Dagenham. I make and knit quilts, knit blankets rather, and there’s another group which is made up of Roding Quilters and anyone else in this area and we call ourselves the Forget-me-not Quilters because it’s, it’s an appropriate sort of title, and we have little labels that we stitch on to the quilts as well as the Linus label – everybody must have a Linus label. And I suppose those groups we’ve made I suppose about 800, 850 since, I don’t, about six or seven years ago I suppose. They don’t, I mean they come in fits and starts. Sunshine Quilters are always making them and other people do them when they can and sometimes at Roding Quilters, a group that I belong to, we’ll have a Linus session, maybe we’ll cut squares or put things together or there’s a challenge each year for Linus to make a block on a particular theme and people are very good and they do respond very well to that. So that’s Linus and it’s really … in a way it’s just sort of paying back. JW: You mentioned the Roding Quilters – that’s the main group that you belong to? PT: Yes, yes Roding Quilters – I did belong to a quilt group called the Monkhams Quilters in Woodford. They didn’t last all that long, they weren’t in a particularly good location and you had to carry your machine up the stairs and the lighting was terrible, it wasn’t very big and eventually it sort of folded and so a few of us who regularly went to Just Between Friends in Roding Valley to buy our fabrics said ‘oh shall we start another group and see what sort of a response we get?’ And so, oh I don’t know, five or six years ago now, we started up the Roding Quilters which is held every month, second Tuesday of the month, in St Mary’s Church rooms in Chigwell and we started off, and I suppose we must have had about 45 to 50 members. It’s now standing at about 30, and we’re not sure really how much longer we can carry on because we have to pay the rent and numbers are going down somewhat. It’s a friendly bunch of people and I like going, even if it’s just to see people, cos a lot of quilting is the social side of things. I also go to the shop on a Wednesday night just to sew, and most of the people on a Wednesday night belong to Roding Quilters too because we were the people who originally started that off. And I also sew on a Wednesday morning, so Wednesday is my sewing day, I love it. JW: Where would you say that you get your main inspiration from in terms of quilts that you make? PT: Well, I, I’m not very good at dreaming up a pattern and I’m not very good at seeing a pattern in a book and thinking oh yes I can do that. My spatial awareness has never been very good, so I prefer to go to a class where I can see the finished article and be instructed on how to put it together. I mean I have done things on my own, very simple things, like Rail Fence and stuff like that which is really easy to do, and my daughter’s white quilt that I made for her bed was just, it’s just plain really, and that had hearts on it as well. But I tend to want to be shown what to do. I feel more confident that way, that I’m going to do it right. JW: So you primarily go to other workshops and classes apart from the quilting group? PT: Yes, yes, mainly at the shop where most of us go. If something takes my fancy I’ll go there. But I make other things as well, I mean I make bags and padded boxes and covered books and all sorts of other things, so I may not be quilting all the time but I’ll be certainly doing something with a quilting theme. JW: So what do you do with all the quilts and objects that you make? PT: Well initially all the quilts I made went to my family, my grandchildren, my sister-in-law, my brother-in-law, I’ve just made a set of three quilts, the same design, a Janet Goddard quilt modern design, two of them to my brother-in-law and sister-in-law and one to a friend who’s 70 at the end of this month so I’ve made that for her. I tend to make quilts for friends who are having a significant birthday. And I’ve made quilts for my home [pause] you can actually have too many quilts in your house, my husband thinks we’ve got too many in my house but… I, I just can’t stop doing it. JW: Do you rotate them round according to the season if you’ve got too many indoors? JW: [Long pause] Is there anything else that you think we should cover? Anything you thought I was going to ask you but we haven’t covered that you think significant to mention? PT: Only that quilting is sewing and I think it’s really, really important that it should still be taught in schools, I know it isn’t, not really to any great extent. But if you sow that seed, forgive the pun, if you sow that seed when people are young, they will have it for the rest of their lives and carry on the tradition. Quilting has had such a revival that I think we need to keep that going. JW: And it’s not, sewing is not currently taught in schools? PT: Not as, not as a discrete subject. [JW: Okay] It’s taught, I think, as part of tech, they call it ‘Textiles’. I think, I mean they do do some sewing but it’s all a lot of design and different ways of using materials and stuff. But I think it, it is so important. I heard recently that a company, a small company making wedding dresses were absolutely desperate for people, seamstresses or anyone who could sew because they cannot get people to sew and make alterations and they’re really at a premium and I think, you know, it’s a craft which has got to be nurtured really. JW: Thank you. Anything else? PT: No, thank you Jennifer.